In the changing broadcast industry in Europe, 4K/UHD represents less of a priority compared to efficiency-boosting technologies that guarantee a clearer return on investment: is IP the future for broadcast infrastructures? The adoption of IP technologies within broadcast infrastructures brings clear benefits to end-users’ operations, both in terms of efficiency and agility. The take-up of IP technology has been slower than expected due partly to end-users’ reluctance to disrupt their existing SDI operations and, more significantly, uncertainty over IP standards has constrained adoption. With all the major players in the interoperability arena backing the new SMPTE standard, ST 2110 – now in final drafting phase – adoption of IP technology for realtime signal flows is set to rise. In Europe, early adopters of IP technology have been large broadcasters and outside broadcast service providers. The main driver behind the decision to move from SDI to IP is achieving increased operational efficiencies. IP technology, which is sometimes deployed in virtualized broadcast environments, enables end-users to access new efficiency-boosting activities such as remote production. A recent example is Canal Plus’ new IP studio, which uses uses equipment from Grass Valley and Cisco installed by system integrator VIDELIO – Media. The same suppliers (Grass Valley, Cisco and VIDELIO – Media) were also involved in the installation of IP technology for Arena TV’s new IP-based fleet – Arena TV is an outside broadcast service provider based in the UK. 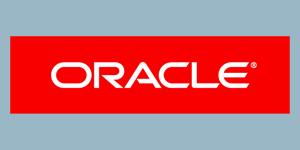 In both cases, the partnership between Grass Valley and Cisco married the capabilities of a large IT vendor with the focused approach of a traditional broadcast technology supplier, incentivizing adoption for the end-user. In Canal Plus’ example, the inclusion of Grass Valley’s equipment was key to the customer, which already used it for SDI operations. Another recent example of a complex broadcast infrastructure being built with IP technology is the new studio in the RTL’s headquarters in Luxembourg. This studio will use a mix of equipment from various media technology suppliers (SAM, Arista, Juniper, Grass Valley, Lawo and Harmonic). The project entails the deployment of a fully ST 2022-6 compliant facility with a clear upgrade path to ST 2110. In Canal Plus and Arena’s examples IP technology was deployed to enable remote production and support 4K/UHD live production. 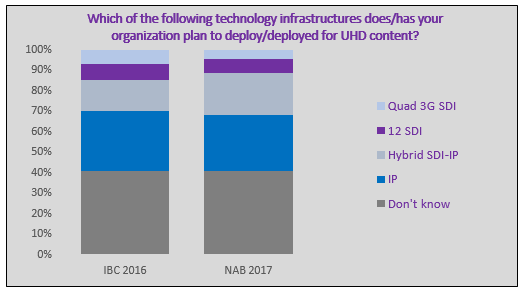 According to the IABM End-User Survey, IP and Hybrid SDI-IP deployments are the most preferred by end-users for enabling UHD content production, including 4K production – see chart below. IP installations to handle UHD are preferred over SDI alternatives (12G SDI, Quad 3G SDI). Despite the benefit of backward compatibility of SDI installations, end-users are reluctant to invest in 12G (or Quad 3G) SDI as they risk getting locked in an expensive technology that could be obsolete when IP becomes mainstream. At the same time, the difficult process of IP standardization has contributed to slowing its adoption. Broadcasters are then faced with an investment dilemma which makes them more likely not to invest in 4K/UHD in the short term and adopt a “wait and see” approach. Of course, 4K/UHD is not just about upgrading the broadcast infrastructure’s data rate but also about increasing storage requirements and (possibly) diminishing the number of channels delivered to viewers – which is likely to translate to lower revenues in a commercial broadcast model. Also, end-users prefer HEVC for 4K/UHD delivery – as highlighted by the IABM End-User Survey data – although usage of HEVC in their organizations is very low compared to more established compression standards such as MPEG-4. These factors have all contributed to slow the adoption of 4K/UHD not only in Europe, but also in North America. Despite the rise in 4K/UHD TV sets adoption by consumers in Europe, the number of 4K/UHD channels launched is still low. Today, 4K/UHD remains a niche market for Pay-TV operators such as BT in the UK and Sky in both the UK and Germany. Commercial and public broadcasters have not gone beyond broadcast trials in the higher resolution format – and/or occasional broadcasts for special live events. This is due to the low revenue potential of 4K/UHD in commercial broadcasting as opposed to Pay-TV. In the changing broadcast industry in Europe, 4K/UHD represents less of a priority compared to efficiency-boosting technologies that guarantee a clearer return on investment. IP is undoubtedly the future for broadcast infrastructures. A visit to the IP Showcase at IBC 2017, where more than 40 technology vendors are demonstrating realtime IP signal flow interoperability based on SMPTE ST 2110, will confirm that the path is now clear for broadcasters and media companies to embrace the flexibility and efficiency that IP can bring to their operations.